ENGLEWOOD — Joyce Lindsey has lived in the same home in the 6000 block of South Normal Boulevard for 30 years. Lindsey said she wants to keep the house in her family, but might not be able to since Norfolk Southern Corp. plans to expand its Chicago rail yard to her neighborhood. "My parents used to own this home, and when they died I inherited it. It has always been my intent to pass this home on to my children," said Lindsey, a 75-year-old widow, who has five children and six grandchildren. And even though there are more vacant lots and boarded-up houses than occupied homes on her block, she still wants to stay. "I have no plans on selling my home. I have too many memories in this house," she said. 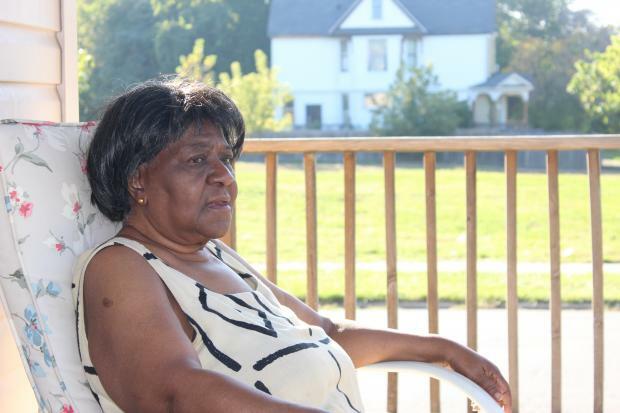 The retired Chicago Housing Authority employee is among 30 members of the nonprofit Englewood Railway Coalition who are refusing to sell their properties to Norfolk Southern. "Money has nothing to do with it. I don't want to move because I love living here. Everyone knows me and we are like family on this block," Lindsey said. "This is a 'base' for my family. My daughter lives here with me and my kids come by almost every weekend. I have never thought about selling this place." Another resident, Rhonda Everett, is renting a home with her mother in the 6000 block of South Stewart Avenue, and said if she is forced to move it might mean she has to transfer her daughter to a new elementary school. "I have a 4-year-old daughter and an 11-month-old son and my daughter goes to school up the street. But if we have to move then I don't know if I would be able to keep her there," said Everett, 28. Steve Rogers, president of the Englewood Railway Coalition, said the rail yard expansion is nothing more than a land grab by Norfolk Southern. "These are hard-working people who have lived in their homes for over 30 years and to tell someone they must sell their home is un-American," said Rogers, whose home is also in the path of the rail yard expansion. "My parents owned this home before me and since 1986 I have owned it. We are Americans who pay taxes and will not stand by while our properties are taken from us." Robin Chapman, a spokesman for Norfolk Southern, said the railroad has acquired most of the properties it needs to expand its intermodal facility at 361 W. 47th St.
"We have obtained more than 90 percent of the privately owned property we have sought, all from willing sellers over the past five years," Chapman said. "All homeowners who have sold to Norfolk Southern have voluntarily agreed to sell their property for a negotiated value that we believe exceeds the market value." He added that Norfolk Southern is also providing moving expenses, replacement housing premiums, attorney’s fees and closing costs for affected homeowners. And the City Council has already approved the sale of 105 city-owned lots in Englewood for $1.1 million for the expansion. Despite some homeowners refusing to sell their homes Norfolk Southern could force residents to move through the eminent domain process, in which a judge could force the sale of property if it's deemed to be in the public's best interest. "We use eminent domain only as a last resort," Chapman said. And "we do need the properties in question to complete the expansion project in the coming years, and 59 lots remain to be purchased." Should eminent domain be needed to acquire property, Peter Strazzabosco, a spokesman for the city's Department of Housing and Economic Development, said the city would have no role in the process. "The city will not be involved in any eminent domain for this project. That is something Norfolk Southern would have to do themselves," he said. Regardless who initiates eminent domain, Rogers said his organization is prepared to fight it. "Their approach towards us have been bad from day one," contends Rogers, a Harvard Business School professor who splits time between Boston and Englewood. "We are not a bunch of poor, black folks who don't know nothing." Rogers said he first developed a 'bad taste' for Norfolk Southern at a September 2011 community meeting at John Hope High School, 5515 S. Lowe St., when "Norfolk Southern [officials] showed up with armed guards." But Chapman said that's not exactly accurate. "Chicago Public Schools security guards were present [at the meeting], which is normal public school security protocol," Chapman said. "A real estate consultant we’ve been working with hired two off-duty policemen for his own protection, who stayed outside during the meeting." Previously, another nonprofit organization had opposed the expansion, but now supports the project after their concerns about air pollution and community benefits were met. "Our role was to address the public interest; to protect air quality, capture and expand open space, ensure a public benefit agreement and an overall fair deal," said John Paul Jones, president of the Englewood Sustainable Initiatives. "These public demands were accomplished, now ensuring homeowners quest for fairest and finalization of the community benefit ordinance is our collective goal."